A High Capacity Level 4 Cross Cut Shredder for heavy office use. Built with a cutting head of Solingen steel and housed in an all steel frame, the C-16C shredder is engineered to give many years of trouble free use. A Thermally Protected Motor, Chain Drive and Steel Gears all provide for maximum slip-free power. The All Metal Drive system uses no internal nylon or plastic gears as is common in lower quality shredders. Operational features include Automatic Start/Stop and Manual controls and an Auto-Reverse feature prevents overfeeding and reduces jamming. The soft touch keypad includes all the functions of the shredder. Audible and visual indicators notify when the bag is full or the door is open and a safety interlock shuts off the shredder. The rubber shock mounts isolate the cutting head noise and vibration and an attractive wood sound deadening cabinet provides for quiet dust-free operation. Features a full 16 feed opening and an Extra Large 50 gallon waste bin. 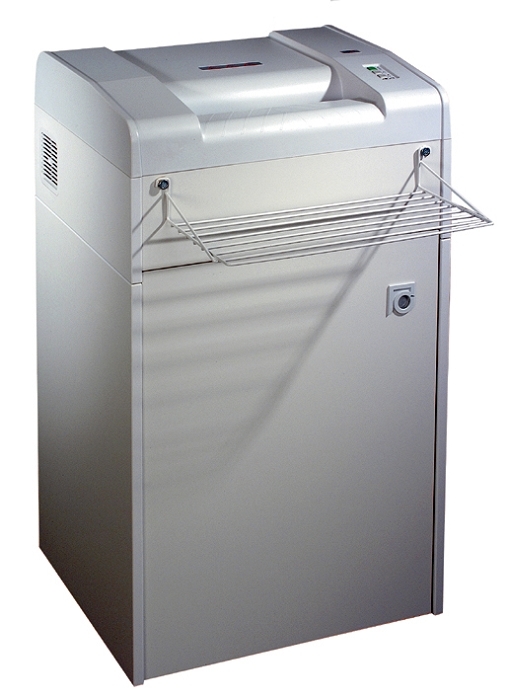 Includes an attachable work rack for stacking paper and Casters allow for easy mobility. Lifetime warranty on cutters.